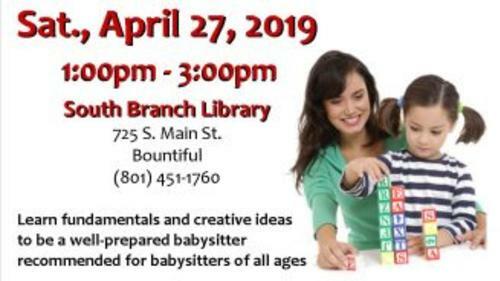 The Davis County Library will be holding their annual Babysitting Boot Camp on Saturday, April 27, 2019 at the South Branch Library (725 S. Main St., Bountiful, 801-451-1760) from 1:00 - 3:00 pm.Target age is 10+ but younger interested children are welcome. This is an introductory class for those getting started with babysitting opportunities. 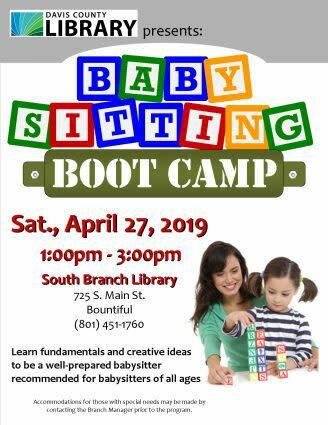 Basic information regarding safety (no CPR certification), snack and activity suggestions, and ideas to be an effective babysitter will be presented.No registration is needed, just show up at the event. There is no cost.Adults are welcome, too.